The video, “Using the Law”, is another video in LifeMosaic’s series “Territories of Life“. It investigates the risks and advantages of going to court. In March 2012, AMAN (The Indigenous Peoples’ Alliance of the Archipelago) and two indigenous communities, Kuntu in Sumatra, and Cisitu in Java, filed a case with Indonesia’s Constitutional Court. They hoped to amend Indonesia’s 1999 Forestry Law, which declared that customary forests and much of indigenous peoples’ territory were state forest land. In May 2013, the Constitutional Court ruled that indigenous peoples’ customary forests are not state forests. While the Constitutional Court ruling was an important step for the recognition of indigenous rights in Indonesia, a recent article in the Jakarta Post notes that “not a single customary forest had been declared by the government to be the property of the indigenous community”, more than two years after the ruling. The Maasai found there were limitations in taking the case to court. It was expensive in terms of money and time. Companies can influence the running of the courts. The case was launched in 2010. It has not yet been concluded. “The cattle rancher took control of our lands and deforested 3,000 hectares of our forests. We didn’t have the freedom to keep our culture going. We went to the Interamerican Court of Human Rights and the court recognised our rights as an indigenous people. But it was eight years before the ruling was enforced. Only after a series of protests, road blockades, and demonstrations in front of Congress was the claim recognised. The United Nations Declaration on the Rights of Indigenous Peoples, United Nations, 2008. Learn and Exercise your rights: A simplified version of the UNDRIP, AIPP, IWGIA et al, 2013. Training Manual on the UN Declaration on the Rights of Indigenous Peoples, AIPP, 2010. The Community Guide to the UN Declaration on the Rights of Indigenous Peoples, Australian Human Rights Commission, 2010. 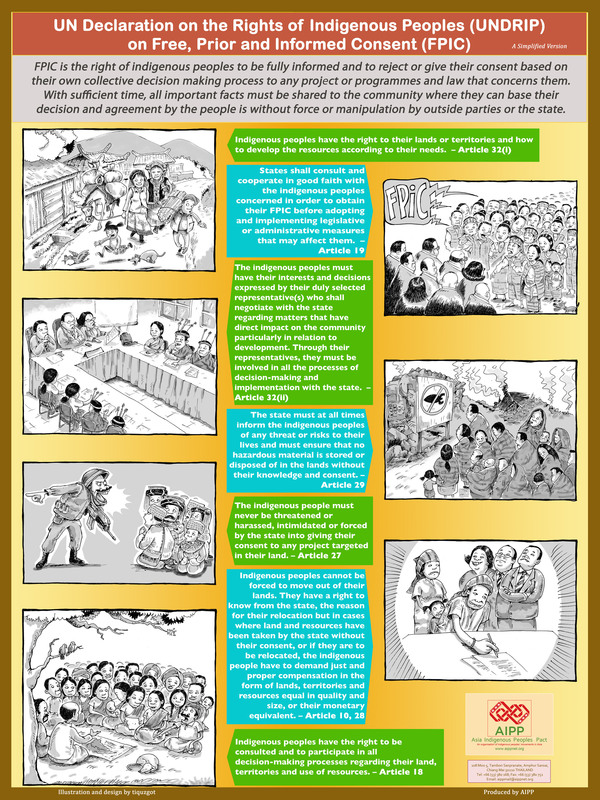 UN Declaration on the Rights of Indigenous Peoples on Free, Prior and Informed Consent Poster, AIPP, 2012. The Right to Self-Determination and Development of Indigenous Peoples, AIPP, 2014. Rights in Action: Free, Prior and Informed Consent (FPIC) for Indigenous Peoples Comic, AIPP, 2013. UN Declaration on Rights of Indigenous Peoples on Rights to Lands, Territories & Resources Poster, AIPP, 2012. Indigenous & Tribal Peoples’ Rights In Practice: A guide to ILO Convention No. 169, ILO / Pro 169, 2009.